A new waterproof deck coating is a sure-fire way to improve the function, durability, looks and value of your patio, deck or pool area. The application of a waterproof deck coating requires know-how and a good set of tools and accessories to complete the job in proper fashion. The sub-floor can be a 3/4 inch plywood base, but a high quality waterproof deck coating requires a lath to guarantee a long-lasting resilient bond. Apply a waterproof deck coating directly on a wood surface is inappropriate and not recommended. The lath base layer is a galvanized metal mesh that is installed over the plywood base and fastened with staples. The waterproofing layer is applied over the lath. The attaching stables must be flat and not protrude above the surface and the lath layer must be smooth and even. If care is not taken during lath installation the functional capability of the subsequent layers of waterproof deck coating will be jeopardized. Therefore, using proper technique with the appropriate tools is vitally important. What tools and accessories are needed and why? Tin Snips are metal-cutting scissors for cutting the lathe to fit over the plywood. These are durable and have long handles to provide leverage for easy cutting. They can be purchased at any hardware store. Pneumatic Staple Gun. After cutting to fit, the lath is anchored to the plywood with heavy-duty 1″ inch crown x 5/8″ long staples. The staples must be completely driven into the plywood to securely attach the lath. 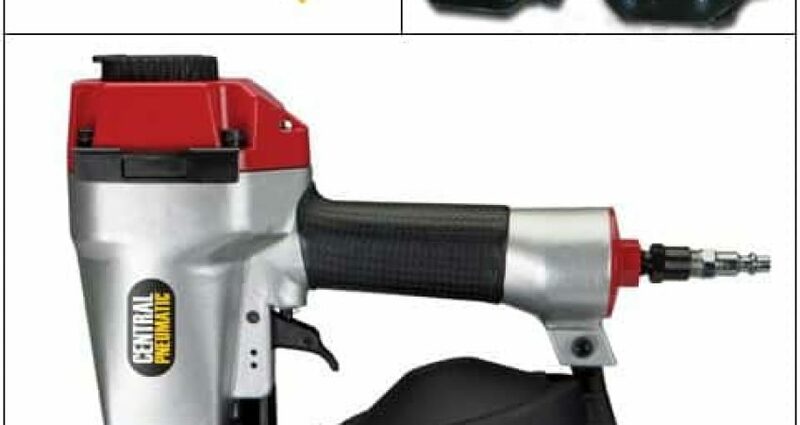 A pneumatic staple gun uses air pressure from an air compressor and provides the power and the staple guidance required to repeatedly perform this task. A density of 16 staples per square foot is used for the body and a staple every 2 ” is used at an overlapping seam or edge. Attempted use of a hand powered stapler would prove to be a very arduous job and has a likelihood of resulting in a high percentage of improperly seated staples. Consistency is the key word here. Pneumatic staples guns are available from a variety of manufacturers. Pneumatic Nail Gun. If nails are to be driven to secure the lath on concrete, a pneumatic nail gun will provide enough power to seat the nail completely and provide speed to complete the job. The pneumatic nail gun uses high air pressure and mechanical design to complete the job consistently. A washer is often used to help secure the lath under the nail head. A Hammer is used to tap down any staples or nails which are not seated securely or rise above the surface of the lath. This will allow a smooth application of the subsequent layers. A Mixing Drill is a variable speed drill with a mixing head attachment. The use of a mixing drill is essential to ensure that the waterproof deck coating is thoroughly mixed before application. A Pool Trowel has a central handle and rounded ends which is used is used to apply coatings of the waterproof deck coating. The design of the tool allows broad even application strokes without gouging. Spiked Shoes are spiked shoe attachments which allow walking on wet coatings without leaving footprints, or removing the coating. Walking over the wet surface during application of color or applying finishing touches can not be done wearing regular boots or shoes. However, if the waterproof deck coating has started to set, even spiked shoes may leave marks. Pli-Dek, Inc. manufactures a wide variety of specialty coatings for the building industry; waterproof deck coatings, fluid applied waterproofing membranes, epoxy flooring and concrete coatings. As experts within the specialty coating niche for over 35-years, Architects, Contractors, and Owners depend on Pli-Dek’s commitment to unparalleled performance and service.